You can change the name that is displayed in the From field next to your address. Go to Settings → Personal information, signature, picture, enter a new value in the Your name section, and save changes. Note. Only your displayed name will change. Your Yandex username will remain the same. Restriction. If your organization's administrator has set a mandatory signature, your personal signature will not be displayed. You can create one or more signatures that will be automatically inserted in the message when it is created, replied, or forwarded. To do this, open the menu Settings → Personal data, signature, picture and enter the signature text in the Your signatures section. You can also format your signature text using the toolbar located above the text box. Click above the text box and enter a direct link to the image. Drag an image from a folder on your computer into the signature input field. When the signature is ready, click Add signature. Move your cursor over the upper right corner of your signature. You can set where to place your signature in responses or designate it for a particular address or language of the text. If you have several signatures, you can select one on the page where you compose emails. To use a signature when sending messages from a specific mail alias, select the option Link to address and choose the email address. By default, the signature is placed at the end of the message or conversation. If you would like to place it immediately after your reply, choose the option under Place signature. Note. This option can be applied across the board to all the signatures you have created. Select the language needed from the list. If you have several signatures, you can select one on the page where you compose emails. Move the cursor to the current signature. Click the button that appears (to the left of the signature). Before typing the text of your message, click Add formatting (to the right of the input box). Refresh the page (press F5). If you notice that the signature does not display after you've written the message, add it manually. If you have social network profiles, the recipients of your emails will see them under the From field. Note. Social network profile images are only supported by Yandex.Mail. If your message recipient uses a different mail service, they won't see your profile in the message header. How can I delete links to my profiles in social networks? If you want to restrict searches that use your profile information, you can change settings on the social sites or Yandex, and links to the profiles will cease to appear within seven days. Go to Privacy in account settings. Select Do you want other search engines to link to your timeline? and click Edit. Uncheck Do you want other search engines to link to your timeline? and click Confirm. Go to the Privacy page in your account settings. In the Open page for search engines and mail services section, select No and save your changes. Go to Privacy in account settings. In the Show my profile section, select only Moy Krug users and save your changes. 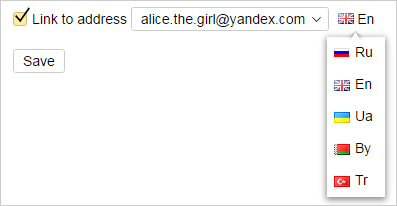 You can prevent Yandex.Mail from displaying profiles that have been found. Go to the social.yandex.com page from your Yandex account. If you would like to prevent other mail services from searching your profile using the linked email address, use your social network profile for authorization. If your profile in a social network is not linked to your Yandex account yet, click the icon of that social network, enter your username, and allow “Yandex.Passport” to access the profile. The action confirms that you are the profile owner. 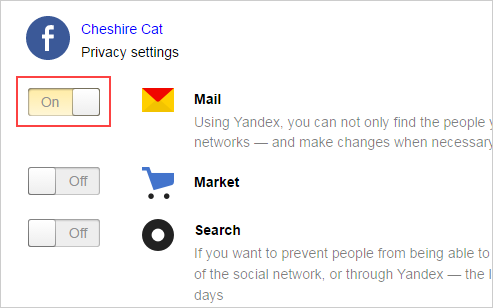 If your social network profile is already linked to your Yandex account, disable the Mail option in the Privacy settings section. Attention. The profile from the social.yandex.com list cannot be deleted after saving the configuration because the settings will be canceled.